I am not a stranger to the Capitol City Brewing Company and this was a huge location. The 2 Massachussetts location is right next to the Union Station and in the same building as the National Postal Museum. Well connected by taking the Red Line to Union Station or take the Circulator bus to this location. Opened in 1992 Capitol City Brewing Company is the first brew pub to open in DC since prohibition. You can take tours of the onsite brewery on request and the beer you are drinking may have been completed just a few hours ago. 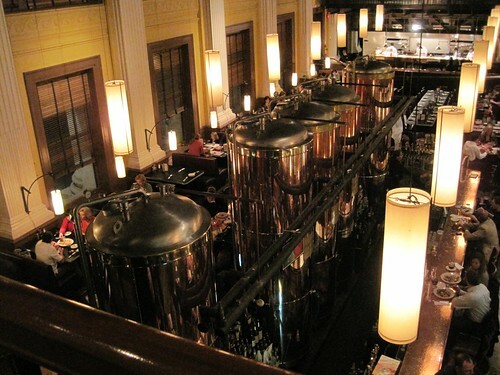 I had the Capitol Kolschon draft which I liked very much and did not stay to try dinner, The appetizer tray was good. Have you been to the Capitol City Brewing Co? What is your opinion ? Labels: Beer, City Brewing Company, food, Microbrewery, National Postal Museum, Recreation, United States, Washington D.C.